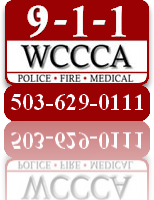 In an effort to maximize the efficiency of our staff we began using an automated attendant on our non-emergency line (503-629-0111). We asked our dispatchers/call-takers about those calls they answer and transfer to another agency most often. The top two were included in the system and are shown below. It is our goal to route all calls for service needing an emergency or non-emergency police, fire or EMS response in the most expedient manner possible. When you call our non-emergency line you will hear the recording diagrammed below. If you know you need a non-emergency response just press zero (0). You do not need to wait to hear that option on the recording. PRESS 2 for the Washington County Jail. PRESS 3 for Washington County Animal Services. PRESS 0 to reach a Call Taker for all other non-emergency needs.